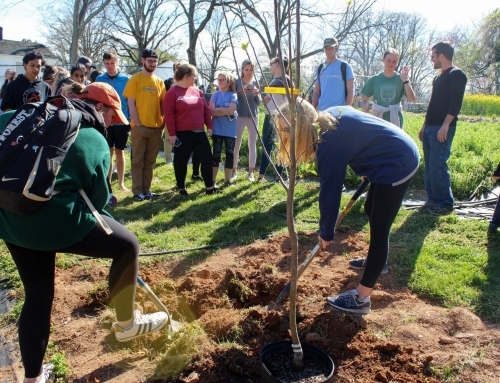 Earth Week 2019 will take place March 31 – April 6, with nearly 15 different events co-organized by leaders from 13 different student organizations and campus offices. 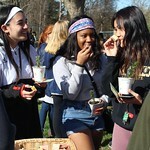 This week-long celebration will center on environmental justice, with a focal point being food access and insecurity. Check out the full line-up of events below! Thank you to our amazing team of co-organizers: Deacon Dining, Facilities and Campus Services, The Pro Humanitate Institute, The Office of Student Engagement, The Office of Jewish Life, The Office of Wellbeing, The Intercultural Center, Campus Kitchen, Student Government, Campus Recreation, The Sustainability Theme House, and Cultivate Environmental Consciousness. 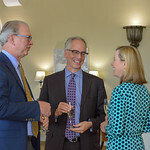 Yellow tree tags will be hung around campus to show the calculated value of ecosystem services that the trees provide, the positive benefits of trees in our landscape, and sentiments from authors about the inestimable value of our beloved trees. Share your favorite tree tags by tagging @SustainableWFU on social media. 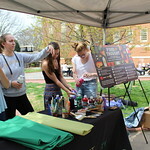 Whether you’re the next Van Gogh or an amateur finger painter, sign up to create a banner in honor of Wake Forest’s Earth Week and our Tree Campus USA designation. 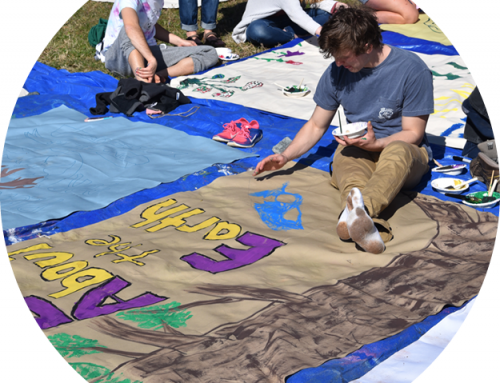 We will have an outdoor banner painting party with music and materials in Tribble Courtyard on Friday, March 29 from 12:30pm – 3:00pm. All student organizations, academic departments and staff offices are encouraged to participate. The banners will be displayed on the Upper Quad during Earth Week. Can’t make it on March 29? Your group can paint a banner on its own! 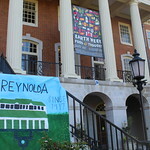 Sign up here for a day and time to pick up your materials (canvas, paint, brushes) from 101 Reynolda Hall. 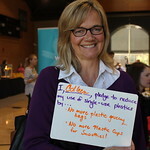 Co-organizers include: The Office of Sustainability, The Office of Student Engagement, Student Government, the Sustainability Theme House, Cultivate Environmental Consciousness and Facilities & Campus Services. 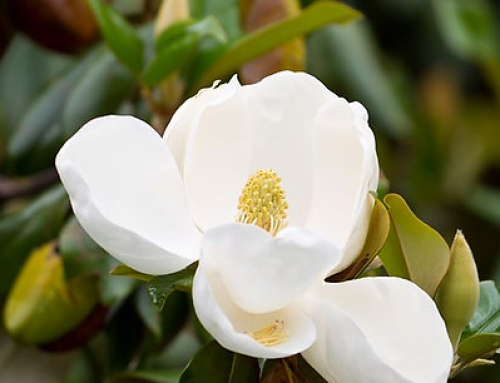 Join us at this festive gathering of people, plants, and animals hosted by the Wake Forest University Campus Garden. Together we will celebrate Tu B’Shevat, the Jewish New Year for Trees, with a blessing and apple tree planting. You will have the chance to sow wildflowers, decorate seed cups, and pot rosemary. Come enjoy live music from local band “Bad Cameo,” fresh food and drinks from local businesses, and tabling by student groups. Co-organizers include: The Office of Sustainability, the Office of Jewish Life and Hillel, and the Office of Wellbeing. 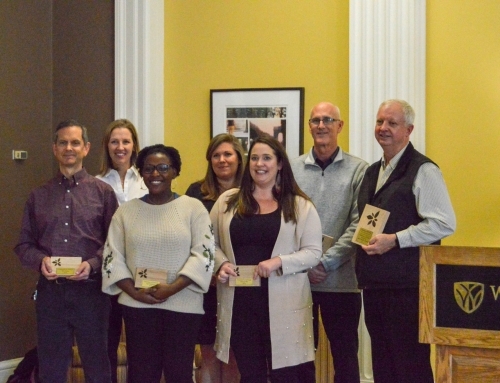 Join us in recognizing those who have gone above and beyond in their efforts and had a significant impact on sustainability at Wake Forest at the sixth annual Champions of Change Campus Sustainability Awards ceremony. Light snacks will be served. All students, faculty and staff are invited to attend and celebrate the remarkable change agents on our campus. RSVP here. Executive Chef Jordan Rogers and Chef de Cuisine Justin Garcia will face off for the second Gold Apron Iron Chef Cook-Off. This fierce competition will feature plant-forward dishes created by these two talented chefs, but there can only be one winner. Join us and watch the food and fun unfold! 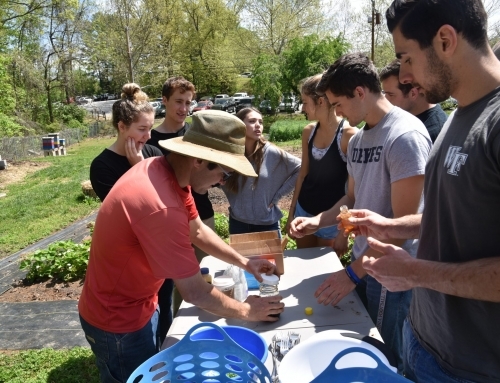 Co-organizers include: Deacon Dining, Harvest Table Culinary Group and the Office of Wellbeing with support from the Office of Sustainability, Student Government, and the Sustainability Theme House. Join us for a thoughtful conversation about environmental justice. We will share a meal, tell stories, and learn together as we discuss the rhetoric surrounding the environmental justice movement and its significance in our communities. This conversation will be guided by Shelley Sizemore, Director of Faculty and Community Engagement for the Pro Humanitate Institute. Whether you are well-versed in environmental justice or hoping to engage with the movement for the first time, you are invited to the table. Register here. 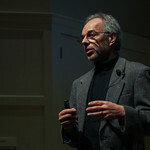 Co-organizers include: The Office of Sustainability and the Intercultural Center. Are you a Pit enthusiast, always making the most of your meal swipes with your creations? Put your culinary skills to the test at our plant-forward scavenger hunt! Four teams of students will compete against one another to make a tasty dish using items from specified stations at the Pit. All are invited to come watch the teams race to complete the challenge. Co-organizers include: Deacon Dining, Harvest Table Culinary Group, the Office of Sustainability and the Plant-Forward Dining Committee. Come learn how to make the most of your food and reduce food waste. We will have tabling stations with activities related to best-by dates, recipes and techniques to extend shelf life of various ingredients, and a demonstration from a Harvest Table Culinary Chef. If you haven’t ridden the Blender Bike yet, now is your chance! See for yourself how a delicious plant-forward smoothie fuels your body. Co-organizers include: Deacon Dining, Harvest Table Culinary Group, the Office of Wellbeing, the Pro Humanitate Institute and Campus Kitchen. For the first time, the beef burgers on the grill in the Pit will be replaced for the entire day with Chef Jordan’s plant-forward burgers, which are 70% beef, 30% mushrooms. Try one yourself and learn how plant-rich diets are the fourth most effective solution to reducing carbon emissions and mitigating climate change. 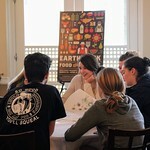 Co-organizers include: Deacon Dining, Harvest Table Culinary Group and the Office of Sustainability. This facilitated conversation on the health challenges that farmworkers face takes place on the heels of National Farmworkers Awareness Week (March 25 -29, 2019). Participants will discuss the health risks associated with farm work, the lack of access to health care, and working conditions. This conversation will be led by Irving Zavaleta-Jimenez, Social Justice Education Coordinator for the Pro Humanitate Institute, with students from the Social Justice Incubator. Co-organizers include: The Pro Humanitate Institute and the Social Justice Incubator. The Farmer that Feeds Us is a doc-series that was released in December 2018 and takes a raw look at food access and insecurity, gentrification and cultural diversity in Charlotte, NC. We will screen episode two of the series and follow-up with a moderated panel. Panelists include: Zack Wyatt, Executive Director of the North Carolina Farm Trust; Chef Njathi Kabui, a Kenyan-born chef, urban farmer and food activist; Samantha Winship, local business-owner of Mother’s Finest Urban Farm who was recently named Minority Female Farmer of the Year by Minority Landowners Magazine; and Michael Banner, an urban farmer and community organizer who serves on the Forsyth Foodworks advisory council. Watch a film preview and learn more here. This event is free and open to the public. WFU students with a student ID will get a free popcorn. Cross Country Trails surrounding the Barn at WFU – Rain or Shine! Come help beautify the wooded area around the Barn and the cross country trails. Awards will be given to the residence hall and the organization with the highest member participation rates. We will celebrate together with a cookout following the cleanup. Register to participate and receive our special edition Cloud Organic campus sustainability Earth Week t-shirt. Co-organized by: The Office of Sustainability, Facilities & Campus Services, Campus Recreation and WFU Athletics. Rain or shine, the show will go on! In the event of rain, we have fun indoor activities planned, t-shirts to give away and a cookout to celebrate the week. 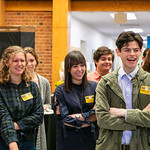 The Southeast regional conference will bring together Campus Kitchen member schools from across southern Virginia, North Carolina, and Georgia for two days of student learning and action! The local group “Keep Winston-Salem Beautiful” is organizing a city-wide cleanup on April 6. This is an opportunity to engage with the greater Winston-Salem community. We have coordinated to have a group of WFU students, faculty, and staff volunteer to clean up the Washington Park section of Salem Creek (between Broad Street and Marketplace Mall). Supplies and lunch will be provided. Sign up here and please contact Nathan Peifer at peifernl@wfu.edu with questions.